It may not be out of place to add an extract from an article published in the Philosophical Magazine by Stokes in 1846. In conclusion, I take this opportunity to thank Mr. A. Graham Bell, who has provided the means for carrying out this work, and. Professor Yogel, the Director of the Astrophysi-calisches Observatorium, for his courtesy in placing the resources of his laboratory at my disposal. Art. 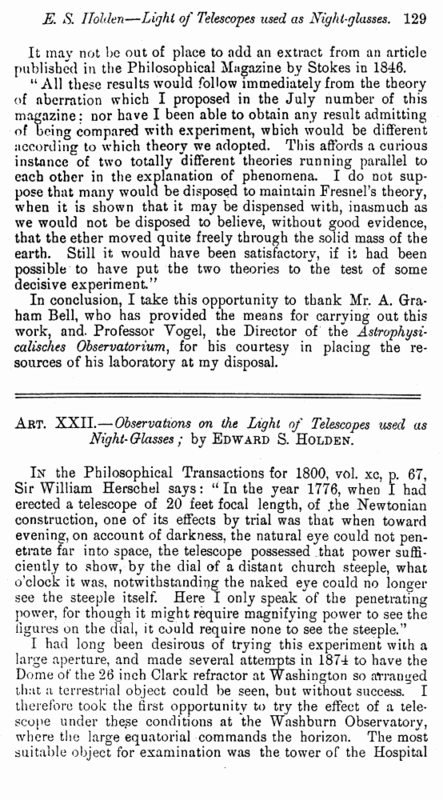 XXII.—Observations on the Light of Telescopes used as Night-Glasses ; by Edward S. Holden.